What can children learn from Hopspots? The possibilities are endless with Mix’n’Match and Code a Spot! Research shows that movement increases learning and with Hopspots movement is used in combination with and for practicing a lot of different skills. Via the game logics, the sounds from the games and the colorful spots with light in, the children are motivated to move and learn, and thereby Hopspots can among others improve the children’s focus, working memory, overview and collaboration skills. The Hopspots-games are designed to activate a large group of children either by dividing them into groups or by having them all play together, depending on the number of children and the level they are at. Hopspots is designed with the fact in mind that children have no patience and pedagogues no time for problems with technology when it is time to play and learn. Thus, we have designed a product that is fast and easy to set up, and where the children can easily help the adults out. 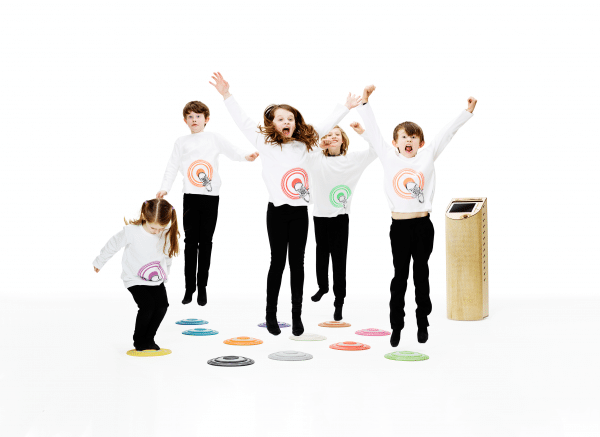 The Hopspots have a wide range, the app is very intuitive to use, allowing even young children to do so, and the speaker unit is easy to move around and use when you play or when charging or storing Hopspots. When our users get started with Hopspots they usually start out with the 5 simple and quick games: The Chase, Sequence, Mix’n’Match, Code a Spot and FlowDance. The next level they reach is when the pedagogues produce targeted games for the children. 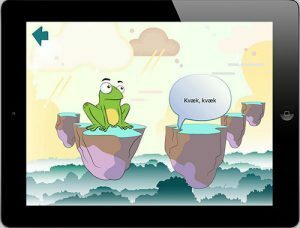 The highest level of use and difficulty, which we would like all Hopspots-users to reach, is when the children become part of the process and produce games in the app. Even very young children can make their own games because they just have to record sounds and take photos with the iPad. When they do that their learning increases as the children learn that they can affect technology and their own learning instead of just consuming material that has already been made for them.